Hey guys! I'm a little hagover today due to long hours of partying last night but thought I make at least one weekend blog post. 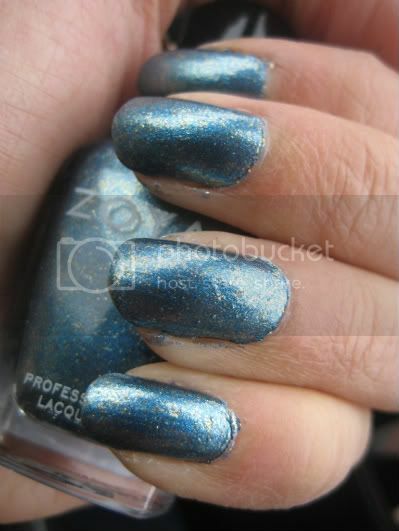 This one is my newest favourite nail polish Zoya Crystal. I picked two of the Fire and Ice polishes and Crystal was the first one that caught my eyes. Crystal is a light blue with gold shimmer. The shimmer is fine and pretty evenly distributed. I find the polish almost looks teal/gold in some light settings. Either way a GORGEOUS colour! I did two layers for this NOTD. Application was a breeze! 2 Responses to "Zoya Crystal"
I love this polish so much... Still haven't picked it up though.